Hi. I have a Compaq Presario 767. After it has been on for a short time, it just turns off. I have to leave it off for about 5 minutes before it will turn back on. I have contacted HP twice with no help. Please help! 1. After you turn on the laptop, after howmuch time does it turn off. 2. When the screen turns off, does the computer shuts down or you can still see the LED lights on or blinking indicating laptop is on. 1. It varies on how long it stays on before it shuts off. I can be 3 minutes or 24 hours. 3. The laptop was purchased last August and the problem began around November. How can I copy and paste the results? and any warning, if present. Hi. It shut down. Just got it back up. It doesn't show any fan speeds. Just the temps that I sent. 1. Check if the fan is working at right speed, dust is accumulated in fan and its heat sink. This can cause CPU to heat up and computer to shut down to save the computer. 2. Bios battery. It is a button type battery located inside your laptop. Replace it. If this doesnt work, than your motherboard firmware needs upgrade or maybe motherboard is damaged. You need to get it repaired or replaced. I would suggest you to take quotes from few places because sometimes replacement is cheaper than repair. 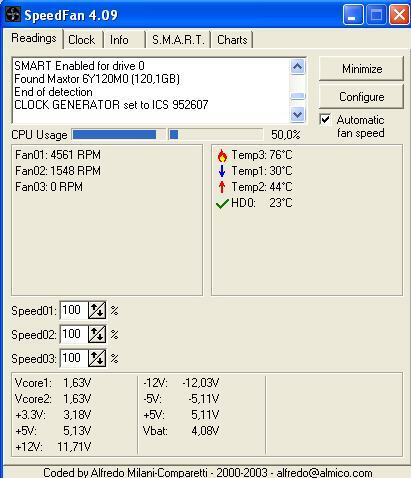 If fan is working fine, than I would take this matter very seriously and take professional help to avoid total failure of computer. Hi. The fan is working. The program you had me download and install does not have any fan readings. Only the temp. Why? I am ready to throw this thing out the window! No, please dont throw it out and give it up. If you think fan is clean (you can see it through vent) and is running at full speed, you should check the BIOS battery and RAM. Other than this even the battery can be a problem. You can easily re-insert RAM using user manual of laptop. Since this is a critical thing I recommend you to take professional help if you are not too savvy with all this. I will try this. I will check/clean the fan and the other stuff you recommeded. You have been much more help than HP ever has been. Thank you soooo much for your help. I am always there to help you with all your computer / internet / marketing related questions. Just write "FOR ANDY in Computers" in your subject and the question will reach me !! Take care and have an awesome day !! I have a Compaq Notebook Presario 2100 purchased in 10/04. I am trying to upgrade to Win 7 on my 6 month old Compaq laptop.